Nationality: American. Born: Robert Selden Duvall in San Diego, California, 5 January 1931. Education: Attended Principia College, Illinois. Military Service: U.S. Army, in Korea, early 1950s. Family: Married 1) Barbara Benjamin, 1964 (divorced); 2) Gail Youngs, 1982; 3) Sharon Brophy, 1991. Career: Studied acting with Sanford Meisner at Neighborhood Playhouse in New York; acted in Horton Foote's The Midnight Caller ; 1957—cast by stage director Ulu Grosbard in studio production of A View from the Bridge , beginning long professional relationship; late 1950s—began acting on television; 1962—cast in first film, To Kill a Mockingbird , at Horton Foote's insistence; 1965—critical acclaim for role in Grosbard's off-Broadway production of A View from the Bridge , and for role in Wait until Dark on Broadway; 1977—on Broadway in American Buffalo directed by Grosbard; first directorial effort, We're Not the Jet Set ; 1979—played title role in TV mini-series Ike ; 1989—in TV mini-series Lonesome Dove. Awards: Best Supporting Actor, New York Film Critics, for The Godfather , 1972; Best Supporting Actor, British Academy, for Apocalypse Now , 1979; Academy Award for Best Actor, for Tender Mercies , 1983. Agent: Arnold Rifkin, William Morris Agency, 151 El Camino Drive, Beverly Hills, CA 90212, U.S.A. The Apostle , New York, 1998. Interview in Interview (New York), September 1977. Interviews in Time Out (London), 27 March 1981 and 8 July 1983. "Robert Duvall: America's Hard-Boiled Olivier," interview with L. McCormick, in American Film (Washington, D.C.), September 1981. Interview with K. M. Chanko, in Films in Review (New York), May 1983. Interview with T. Ryan, in Cinema Papers (Melbourne), July 1984. Interview with Laura Dern, in Interview (New York), October 1991. Interview with G. Cheshire, in Filmmaker (Los Angeles), no. 2, 1998. Interview with E. Weitzman, in Interview (New York), March 1998. Slawson, Judith, Robert Duvall: Hollywood Maverick , New York, 1985. Current Biography 1977 , New York, 1977. Foote, Horton, "Robert Duvall: No Limits," in Close-Ups: The Movie Star Book , edited by Danny Peary, New York, 1978. Bogre, M., "The Filming of Angelo My Love ," in American Cinematographer (Los Angeles), July 1981. "Robert Duvall," in Films in Review (New York), May 1983. Robert Duvall Section of Positif (Paris), April 1984. Hibbin, S., "Robert Duvall," in Films and Filming (London), May 1986. Weinraub, Bernard, "Playing Stalin the Man Not Stalin the Monster," in New York Times , 5 November 1992. Alexander, Max, "Above the Line," in Variety (New York), 15 November 1993. Lally, K., "Keeping the Faith," in Film Journal International (New York), vol. 101, January 1998. From his screen debut as silently staring Boo Radley, the antithesis of a childhood bogeyman, the skull-faced Duvall has often acted like the eye of a hurricane, unleashing his power upon spectators when they least expect it. His specialty is submerged violence that overheats and then steams out of simple souls, and he is an expert at playing self-controlled men who should not be pushed too far. Throughout his steady career as a character star on a par with Gene Hackman, Duvall has (until recently) never given a less than multifaceted performance in even the smallest roles. With just a glance, he sums up Boo Radley's entire solitary life as a child-man cut off from normal human experience in To Kill a Mockingbird. Psychologically damaged in Captain Newman, M.D. , way too sure of himself in True Grit , and disastrously clueless about Shirley Knight's needs in The Rain People , Duvall never seemed like the same actor in any of these movies, and that invisible adaptability may have prevented him from coming to prominence sooner. Although he is a drolly funny born-again phony in M*A*S*H , and touchingly overwhelmed as a futuristic man in THX-1138 , Duvall's key role is Tom Hagen, the buttoned-down Mafia facilitator in the Godfather movies. Always weighing his options and always loyally cleaning up after his colorful masters, Duvall's outsider is a fully realized characterization, the compromised man blinded by forever looking the other way. Over the years, Duvall continued painting his one-man gallery of regional types—luminous portraits of faceless Americans living lives of quiet desperation. Instead of repeating himself, Duvall broadened his artistry and reworked his stage performance as the hapless Jackson Fentry in a grim Tomorrow with an intuitive grasp of how to scale down the performance for the cinema. 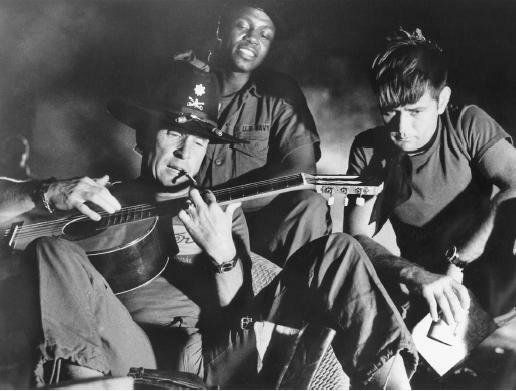 As vital a presence when gearing up for bombast as he is with harkening attention with an actor's silences, Duvall can be insinuatingly sinister while running a Network , appallingly macho while badgering his family with Marine mentality in The Great Santini or hilariously psychotic as a lieutenant colonel treating Vietnam like a vacation spot in Apocalypse Now. Even in junk such as The Betsy , he does not abdicate his responsibility to the audience. Although he beat four acclaimed Brits to win his best actor Oscar for Tender Mercies , his redemption-seeking country-western singer does not have the full-bodied richness of his detective eaten up by the acid of departmental corruption in True Confessions , or his rock-solid street cop in Colors or his loving family man in Rambling Rose. Perhaps that is because he is playing a symbolic force in the dry-as-dust Tender Mercies and can develop the characters in these other films along less pretentious lines. Lately, Duvall has been stretching himself with roles outside his safe Yankee territory. Despite his wavering accent, he is touching as a straight-laced Cuban gentleman in the geriatric soap opera, Wrestling Ernest Hemingway. If he appears to be home on the world-weary prairies of Lonesome Dove , he seems out of place in Russia as Stalin. As versatile as he is, his uncluttered directness is more compatible with interpreting such American figureheads as Ike than foreign despots. Floundering in the Harlequin Romancing of Hawthorne's The Scarlet Letter , Duvall is betrayed by the insipid writing and composition-conscious director into botching a part that he is temperamentally attuned to, the demented Roger Chillingworth, an avenging angel hiding behind a bible. In the comedy Something to Talk About , he makes his mint-julep patriarch dismayingly funny without softening the edges of this bullying father role. In the legal eagle thrillers, A Civil Action and The Gingerbread Man , he breathes fresh histrionic life into stale courtroom theatrics. Although he can be an imposing presence, Duvall can seamlessly ease himself into the gentle framework of domestic dramas like A Family Thing (as a white man improbably bonding with Afro-American relatives) and Stars Fell Over Henrietta (as a smoothie redeeming himself by making his piein-the-sky promises come true). In these films, Duvall manages to embody common folk while denying none of the force of his star personality. Like Thomas Mitchell or Claude Rains, Duvall is a great character actor, who is also a star. Unlike those supporting leads, however, Duvall can carry a movie on his own; when he steps into a tiny role, he usually steals the film from its nominal leads. Taking time out from acting to direct personal projects (e.g. Angelo, My Love) , Duvall wrote a juicy role for himself and elicited a great performance for himself in The Apostle , which took 13 years for this actor/director to bring to the screen. Although some critics noticed that he had stacked the plot decks too favorably in his character's direction, Duvall is mesmerizing as an evangelist who brooks no questions of faith from his own family. In a shocking indictment of pride going before a fall, the hypnotic preacher flees prosecution for beating his wife's lover, only to find he's locked in a guilt-mode worthy of Raskolnikov. Even in unmitigated blockbuster rubbish like Deep Impact , Duvall remains a tower of strength. When he cares about his material, he's unforgettable. To move with such ease from gem-like cameos ( Slingblade) to mass entertainments ( Phenomenon) to star turns ( The Apostle ) is the mark of a singular talent. In the Duvall canon, the part may be that of an ordinary person, but Duvall always gives a face to anonymity. Other actors are in touch with their feelings; Duvall is in synch with the desires of the characters he inhabits.